Cardiac Computed Tomography has progressed beyond providing a purely detailed anatomical description of coronary disease, to a comprehensive demonstration of anatomic-physiological disturbance that forms the basis of a “one stop shop” for assessment of coronary disease. The 320MDCT wide area detector provides a unique capability to assess the whole heart during a single gantry rotation. 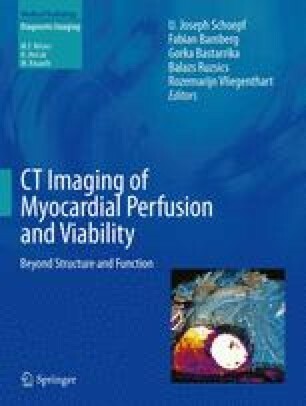 This chapter outlines the scientific advances made using the 320MDCT: in animal models of cardiac ischemia followed by translational work in human subjects; initially with discussion of single centre trials followed by introduction of the Core 320 multi-centre trial.